Around 6 million children globally suffer from cardiomyopathy, and 1000 of them are in the Netherlands. Cardiomyopathy is a serious and often congenital cardiac muscle disease. Almost half of these children die within five years following diagnosis of the disease or can only go on living with a heart transplant. Unfortunately very little is known about cardiomyopathy among children. The Heart Dream Foundation wants to change this and is financing scientific research into children’s cardiomyopathy. This research is to improve treatment and quality of life for these very sick children. And maybe one day, in a beautiful dream, to heal cardiomyopathy. Lucas Valentijn is one of these 1000 children. In October 2011, Lucas was diagnosed dilated cardiomyopathy, a cardiac muscle disease. For three years his heart was too weak to function without a continuous and extensive course of medication. After more than three years of insecurity and many hospital visits, Lucas was officially placed on the waiting list for a new heart on January 2, 2015. On February 19th, there was a donor heart for Lucas. After the heart transplant his quality of life increased enormously. Lucas can be a child again! In order to counteract rejection of the new heart, Lucas still has to take a lot of medication. He will remain under strict control in the Sophia Children's Hospital in Rotterdam for life. The future remains unclear. A transplanted heart has a life span of an average of 15 to 20 years. Research on new developments is therefore of vital importance to determine a better future prospect for these children. Now two years after his heart transplant, Lucas is aiming to deliver a world performance through participation in the Hartedroom Mont-Ventoux Challenge 2017. 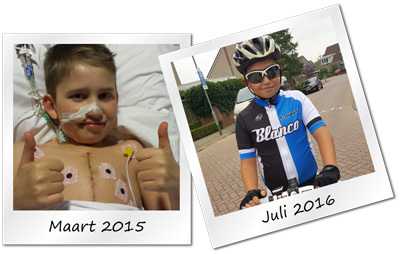 Lucas will be the first transplanted child to climb Mont Ventoux. September 21, 2017 is the day! The participants, including Lucas Valentijn, will climb the Giant of the Provence, cycling / walking / running, to raise money. Help us to come one step closer to achieving our HEART DREAM! All experienced and amateur cyclists, runners and walkers, you are invited with friends and family to join us in this challenge of climbing Mont Ventoux and help us achieve our dream. Sign up with the registration form. The entry fee is 100 euros per person. For this you will receive a Hartedroom Mont-Ventoux Challenge sports wear, support during the climb and a participant dinner in the evening. Travel and accommodation are not provided, however arrangements have been made with two accommodations, see the program page. Download the Mont-Ventoux Challenge 2017 flyer in pdf format.